The American Dietetic Association is heading to sunny San Diego for the Food & Nutrition Conference & Expo, beginning September 24. Get ready for a refreshing surprise—the San Diego food scene has really sprouted over the last few years. We asked local food experts to give us a sneak peek at what’s cooking in the city. What do you get when you toss together a mild, sunny Mediterranean climate, diverse yet fertile soil systems, and a city teeming with wholesome, energetic people? You get a boon in small, local, organic farms—exactly what’s happening in San Diego today. The city’s climate gives it the ability to grow crops year-round, while the surrounding diverse topography of coasts, mountains, and plains is better suited for small farms over large-scale farming. Thus, boutique farms are popping up across the region like mushrooms, making a direct impact on the city’s dining scene. The number of farms in San Diego County has increased by 31.5% from 1978 to 2007 compared with an 11% increase in the state. This growth is attributed to the rise in the number of farms ranging in size from 1 and 9 acres, making San Diego the No. 1 county in California for small farms. 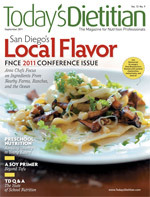 Brook Larios, a San Diego-based food and lifestyle writer, believes that the defining aspect of the city’s food scene is the local food trend. “There are an increasing number of chefs with the farm-to-table philosophy. It’s a huge trend; local food is almost a mantra for chefs here. ‘Farm to table’ is no longer the catchphrase; now it’s ‘What farm did you source the produce from?’ Chefs have a relationship with farms,” she says. This eating philosophy even pertains to fish from local seas and livestock on local ranches. In San Diego, don’t be surprised to find restaurant menus with category headings that read “Ocean, Farm, and Ranch.” The thing that’s really cool about San Diego is that all three of these categories can be sourced locally. If there’s a second defining feature of San Diego cuisine, our experts agree it has to be the local craft beer movement. San Diego is now a mecca for people in search of the fine, artisanal beer that has become legendary. BeerAdvocate magazine recently bestowed on Stone Brewery Company, San Diego’s darling of the craft beer world, the title “All-Time Top Brewery on Planet Earth.” Karl Strauss, AleSmith, and Ballast Point are all celebrated craft beers with a common hometown of San Diego. Ask a local foodie which restaurant most precisely embodies the San Diego farm-to-table movement, and they’ll probably point to The Linkery (3794 30th Street, North Park, 619-255-8778, www.thelinkery.com). “The Linkery was one of the first restaurants to make a big push for farm to fork,” Larios says. Tender Greens (2400 Historic Decatur Road, 619-226-6254, www.tendergreensfood.com) is another restaurant that highlights the connections between the farm and the plate, according to Woo. “Tender Greens works with local farms to source produce, and the chef also does his own charcuterie to supply the restaurant. It’s an affordable, fresh option,” she explains. Indeed, you can easily trace the uncomplicated food served at Tender Greens back to the earth—the handpicked vegetables come from Scarborough Farms, the beef is hormone and antibiotic free, the chicken is pasture raised, and the tuna is line caught in the Pacific. Stop by and enjoy a simple yet extraordinary Tuna Nicoise salad or Marinated Flank Steak with Yukon gold mashed potatoes to celebrate slow food at its best. Forming a “collaborative trifecta,” Waters Fine Catering, Alexandria Real Estate Equities, and Urban Plantations worked together to create a garden in the middle of UTC that provides fresh produce for Fibonacci’s salads. Set in a LEED (Leadership in Energy and Environmental Design) certified building, Fibonacci’s offers freshly made soups, salads, sandwiches, and entrées at reasonable prices for breakfast and lunch during the week. And don’t stop at restaurants if you want to experience San Diego’s burgeoning farm–to-fork movement. Take a trip to the farmers’ markets. “Our own farmers’ market is really great. It’s in Little Italy in a fantastic, beautiful setting by the ocean. They serve cooked food that’s grown locally too,” Woo says. The Little Italy Mercato farmers’ market opens on Saturdays from 9 AM to 1:30 PM on Date Street and India to Columbia (www.littleitalymercato.com). “Craft beer goes hand in hand with locally grown foods. No matter what you’re serving, you must have local beer to be relevant here. Even the fine dining places serve craft beer,” Woo says. She recommends visiting two breweries near the convention center for a taste of local craft beer: Mission Brewery (1441 L Street, 619-544-0555, http://missionbrewery.com) and Karl Strauss Brewing Company (5985 Santa Fe Street, 858-273-2739, www.karlstrauss.com). The gastropub movement is thriving in this city known for its spectacular beers; it’s a shame to visit San Diego without stopping at one of its cool, hip pubs, where sometimes the food even lives up to the beer. Escondido’s Stone Brewing, world famous for its focus on great craft beer, offers the dining establishment and gardens Stone Brewing World Bistro and Gardens (1999 Citracado Parkway, Escondido, 760-294-7866, www.stoneworldbistro.com), with a boutique hotel coming soon. “For their beer garden, they took over an 18-acre area farm where they started growing food. Stone Brewing World Bistro is the largest purchaser of local food here,” Woo adds. Take a stroll through the gardens, sample intriguing menu items, such as The Soft & Stinky Cheese Plate or 3 BBQ Duck Taco, and don’t forget to taste one of Stone’s legendary draft beers—from Smoked Porter to Russian Stout. “Blind Lady Ale House has amazing food plus craft beer,” Clark says. Though the focus is on high-quality draft beer, Blind Lady Ale House (3416 Adams Avenue, 619-255-2491, www.blindladyalehouse.com) is especially proud of its direct-draw system that places the kegs in direct contact with the faucets. And there’s much to like about this gastropub’s food. The pizza is made with organic, locally grown produce from nearby Suzie’s Farm or the farmers’ market. Even the house-made sausages and soyrizo are sourced from the San Diego environs. “They have craft beer, and it’s very farm to table with great salads and hand-crafted beer—you get both all in one place,” Woo says. “The Neighborhood has an impressive beer section with burgers and house-made sauces. It’s in the really exciting transitional neighborhood of North Park, and they have delicious beer and unique pizza creations,” Clark says. The Neighborhood (777 G Street, 619-446-0002, www.neighborhoodsd.com) patterns itself after the gastropubs of London and izakayas of Japan, offering 27 craft microbrews on tap, such as Port Anniversary Ale and Lost Abbey Lost & Found. The gastropub pairs its beer with creative yet simple fare such as Farmer Fresh Strawberry Spinach Salad, a Spicy Cajun Rubbed Burger, and Pasilla Steak Frites. Jaynes Gastropub (4677 30th Street, 619-563-1011, www.jaynesgastropub.com) and Proper Gastropub (793 and 795 J Street, 619-255-7520, www.propergastropub.com) also are among Larios’ favorites. With a reverent nod to her British heritage, Jayne Battle patterned her namesake establishment after the London gastropub scene in the 1990s. You can find classic pub food, such as Bangers and Mash and Sea Bass Fish and Chips alongside Grilled Polenta With Seasonal Vegetables—of course, with a cold San Diego IPA or Guinness to wash it down. Like Jaynes, Proper Gastropub has authentic British blood flowing through its veins—the owner was raised outside London on good old-fashioned pub food. So you’ll be sure to find pub staples, including chips, mac ‘n’ cheese, and pork chops and applesauce at Proper Gastropub, which is located in The Park at PETCO Park with an excellent vantage point to take in a ball game. But that’s not all you’ll find at this eatery—the chef’s “farm-and-ocean-to-table special” features fresh organic produce from the local farmers’ market and fresh seafood. While Sea Rocket Bistro serves other fare, such as grass-fed beef and local vegetarian dishes, owner/executive chef Chad White is best known for his inspired seafood dishes, such as Mitch’s Fresh Point Loma Sea Urchin in the shell with lemon and smoked sea salt and Carlsbad clam steamers with white wine, garlic, parsley, chili, lemon, leek, and skate sausage. There’s a new attitude emerging in San Diego’s upscale dining scene, which seems to march to a different beat from chic restaurants you might encounter in sophisticated food cities such as Chicago or New York. San Diego is making its own mark on New American cuisine by creating its own food aesthetic: classic comfort food with an inventive, seasonal flair. Some of the most celebrated chefs in San Diego dish up their buzz-worthy cuisine in casual, comfy settings. Take Searsucker (611 5th Avenue, 619-233-7327, www.searsucker.com), one of the city’s most celebrated restaurants, situated in the trendy Gaslamp Quarter near downtown San Diego in an airy space furnished with rustic farm tables and deep linen sofas. Searsucker’s award-winning celebrity chef Brian Malarkey, who hosted TLC’s Mega Bites and was a Bravo Top Chef finalist, dreamed up this restaurant that features New American Classic cuisine “with a unique and honest approach.” He pairs his approachable dishes with local craft beer or a selection from the extensive wine list. Try Malarkey’s Scallops “Baja” with johnnycake, watermelon, and Fresno romesco or chicken with whole peas and carrots and smoked corn to glimpse his vision of New American cuisine. CUCINA urbana (505 Laurel Street, 619-239-2222, www.urbankitchengroup.com) also tops many food experts’ lists for the best dining experience in San Diego. In this California-inspired Italian kitchen and wine shop, the atmosphere is rustic farmhouse with the utilization of reclaimed wood and interior features. The food is seasonable, sustainable, and affordable—all menu items are $20 and under. Now that’s an idea sure to catch on: affordable, sustainable meals that deliver on simple elegance and flavor. Check out dishes such as Parmesan Panko-Crusted Eggplant with farro, feta, and zucchini with Castelvetrano olive and sundried tomato pesto to see how CUCINA urbana translates its culinary viewpoint to the dinner plate. Bankers Hill Bar + Restaurant (2202 4th Avenue, 619-231-0222, www.bankershillsd.com) comes from the same mold, offering unpretentious classic American fare with upscale notes for a reasonable price—again, there’s nothing over $20 on the menu. Hard to believe with dishes, such as Truffled French Fries; Deviled Farmers’ Market Eggs served with handcut lemon potato crisps, arugula salad, and Parmesan; and Hickory Smoked Tri Tip with sweet corn and red pepper polenta, broccolini, and red wine jus. Of course, you have to wash down these comforting dishes with a cool swill of local craft beer from Bankers Hill’s ample beer list. You’ll hear most San Diegan foodies crow over Whisknladle (1044 Wall Street, 858-551-7575, www.whisknladle.com), a labor of love from Chef Ryan Johnston, who runs what the San Diego Union Tribune calls one of the “most hard-working kitchens” in the city. That’s because Whisknladle does pretty much everything from scratch—from salumi meats and pickled vegetables to ice cream and cocktail bases. “Whisknladle is a little more casual, but it’s really nice. Chef Ryan Johnston is amazing. He’s one of the best in San Diego,” Larios says. The restaurant world agrees: Whisknladle made Condé Nast Traveler’s Hot List Tables 2008. At Market Restaurant + Bar (3702 Via de la Valle, Del Mar, 858-523-0007, www.marketdelmar.com), executive chef/owner Carl Schoroeder has made quite a name for himself, winning a James Beard Award for California Chef of the Year in 2004, along with a string of other accolades. The ambience of Market is modern yet comfortable, with its striking shades of persimmon and sage set against chocolate brown. Like many award-winning chefs, Schoroeder has developed a tasting menu to showcase his culinary arts, although you can sample specialties such as Maytag Blue Cheese Soufflé with rhubarb chutney, strawberry-organic watercress salad, and spiced almonds, or Spice-Rubbed Pacific Red Snapper and Sesame-Prawn Tempura with asparagus roast, shaved vegetable salad, and truffled citrus-soy emulsion on the dinner menu. And if you’re in search of old-world elegance, you won’t leave disappointed. While San Diego is creating a brand of fine cuisine that’s more about comfort than refinement, this rule certainly doesn’t apply to some of its most sophisticated establishments. Just consider the culinary arts of one of the city’s most prestigious chefs, William Bradley of Addison at the Grand Del Mar Resort (5200 Grand Del Mar Way, 858-314-1900, www.addisondelmar.com), which Larios calls the “upper echelon of dining in San Diego.” Bradley’s elegant French-meets-California cuisine has won him critical acclaim: He’s earned the title of Relais & Chateaux Grand Chef and was nominated for three consecutive years for the James Beard Award for Rising Star Chef. Addison’s elegant ambience suits its sophisticated fare, which changes regularly and has included dishes, such as Atlantic Sablefish with black olive agnolotti and garden pistou and Lamb Rack Persillé with cassoulet de endive and chèvre chaud. Wine director Jesse Rodriguez presides over Addison’s award-winning wine program, which includes top California vintages as well as newly discovered gems from places such as South Africa and New Zealand. “The Lodge at Torrey Pines’ restaurant, A. R. Valentien, is at the top of the list,” says Woo of San Diego’s finest dining experiences. “The restaurant is spectacular, and the food is locally sourced—it’s lovely.” Named after a California artist, A. R. Valentien (11480 North Torrey Pines Road, 858-777-6635, www.arvalentien.com) offers fresh, regional cuisine in a Craftsman-style timbered room decorated with original Valentien canvases that overlook the 18th hole of the gorgeous Torrey Pines Golf Course. Set on a rooftop garden adjacent to the Hotel Solamar in the Gaslamp Quarter, Jsix Restaurant & Lounge (616 J Street, 619-531-9744, www.jsixrestaurant.com) offers a sumptuous experience worth sampling, according to Woo. Executive chef Christian Graves goes for pure, coastal culinary style at Jsix, exemplifying the slow food philosophy by using local organic produce; sustainable seafood; and grass-fed meats with artisanal, hand-crafted flair. Dishes such as Seared Mano de Leon Scallops with squash blossom-mascarpone risotto, paddy pan squash, basil, and Parmesan reduction or Grilled Petite Filet of Beef with wilted baby spinach, creamy mashed potatoes, and brandied cherry reduction showcase Graves’ skills as a young chef on the rise. Considering San Diego has a 70-mile stretch of beach, there’s no shortage of restaurants with romantic seaside views on which to feast your eyes. “I think the best view in San Diego is Island Prime and C Level,” Clark says. Island Prime and C Level (880 Harbor Island Drive, Harbor Island, 619-298-6802, www.cohnrestaurants.com/menu-restaurants/island-prime) sits on stilts atop San Diego Bay, overlooking the city skyline and Coronado Island. The restaurant takes advantage of its gorgeous views with a special Sunset Dining menu; you can feast on their signature Lobster Bisque with sherry cream or Cedar Plank Seared Salmon with cucumber salsa and black linguini with chipotle cream sauce. Bertrand at Mister A’s (2550 5th Avenue 12th Floor, 619-239-1377, www.bertrandatmisteras.com) also offers stunning views, according to Clark. Located on the 12th floor of a building with wraparound decks and a view that stretches for miles over San Diego Bay, Point Loma, and Coronado, this elegant restaurant has become a famous location for Valentine’s Day dinners and “popping the question.” The modern American cuisine with touches of France and the Mediterranean has received a string of accolades, but perhaps the restaurant is most proud of its No. 4 spot for Best Scenic View Restaurants in the nation by OpenTable Diners’ Choice. “We have a southern California philosophy here, so we have food from all over the world,” Larios says. Sure enough, you can find food from just about every corner of the world—from Ethiopia and India to Japan and Vietnam. And of course, since San Diego is minutes from the border, Mexican food is authentic and plentiful. You’ll find the best glimpses of genuine traditional cuisine outside of the glittering tourist areas. “The true good ethnic restaurants are better in the ghetto where you pay less than $10,” Clark says. • Ethiopian: Muzita Abyssinian Bistro (4651 Park Boulevard, 619-546-7900, www.muzita.com) is one of Woo’s recommended ethnic spots where the Ethiopian food is mostly vegetarian and is “presented very nicely.” You can sample unique fare, such as Eritrean-style seasoned ground chickpeas or Zigini Beggie (Berbere braised leg of lamb with stewed tomato and onion). • Japanese: Woo favors Yakitori Yakyudori (3739 6th Avenue, 619-692-4189, www.yakyudori.us) for Japanese small plates of barbequed favors, such as beef and chicken sticks and salads. • Indian: Surati Farsan (9494 Black Mountain Road, 858-549-7280, www.suratifarsan.com), a little kitchen shop that sells food for take-out or sit-down dining, is “the best Indian food here,” according to Larios. You can find traditional dishes that range from Kachori (fried spicy balls stuffed with peas and green pepper) to Sev Ussar (pea soup topped with crunchy noodles). • Lebanese: “Mama’s Bakery is an incredible hole-in-the-wall place for Lebanese food. It’s one of my favorite restaurants,” Larios says. Specializing in traditional Lebanese dishes, Mama’s Bakery (4237 Alabama Street, 619-688-0717, www.mamasbakery.net) is known for its wraps, falafels, hummus, baba ghanouj, tabouli, and pastries. • Chinese: Larios gives Dumpling Inn (4619 Convoy Street, 858-268-9638) a shout out for its great Chinese food. Along with several varieties of dumplings and potstickers, specialties include sea bass with black bean sauce. • Italian: For authentic family-made Italian food, Larios suggests stopping at Rosina’s (3613 Ocean Ranch Boulevard, Oceanside, 760-721-5000, www.rosinasoceanside.com) for fresh pasta, pizza, soups, and other classic Italian fare. Clark says Bencotto (750 West Fir Street, 619-450-4786, www.lovebencotto.com) is a great little restaurant offering authentic Italian food in San Diego’s very own Little Italy. If you’re in search of a pleasant night out in a neighborhood ripe with good food and aromas, San Diego won’t let you down. Clark suggests North Park, in the bustling neighborhoods of Hillcrest, South Park, University Heights, and Bankers Hill just north of Downtown San Diego, and Balboa Park as a destination-worthy “food” neighborhood. Included in this borough’s restaurant lineup are The Linkery and Sea Rocket Bistro as well as Urban Solace (3823 30th Street, 619-295-6464, www.urbansolace.net), another hip restaurant boasting its Southern interpretation of New American cuisine with a commitment to local farms and beer. Executive chef Matt Gordon serves up fare such as Warm Cheese Biscuits served with Orange-Honey Butter, Fried Green Tomatoes with spicy herb purée and whipped goat cheese/crème fraiche, and Braised (local) Beef Cheeks with smoked tomato jam, sweet potato mash, and mustard and garlic jus. So while you’re in San Diego for FNCE, take to the streets and enjoy the city’s New American interpretation of cuisine. You might find it so fresh and intoxicating, you’ll be back for more! — Sharon Palmer, RD, is a contributing editor at Today’s Dietitian and a freelance food and nutrition writer in southern California.